In 1799 Lord Elgin was appointed ambassador of Great Britain to the Sublime Porte at Constantinople. In 1800 he dispatched a team of artists to Athens, which then formed part of the Ottoman Empire. They were charged initially with drawing the monuments and making casts to adorn the lord’s country house in Scotland. At that time Elgin was not considering the removal of anything from the Athenian Acropolis.When, in the course of international political events, Turkey forged a fruitful alliance with Britain against France, the Sultan became favourably disposed towards Elgin, as British Ambassador, who seized the opportunity for personal gain by acquiring an enormous collection of antiquities. His attention was focused primarily on the monuments on the Acropolis (the Parthenon topmost) which were very difficult of access and from which no one ever had been granted permission to remove sculptures. Concurrently, by showering Turks in Constantinople and Athens with gifts and money and by using methods of bribery and fraud Elgin persuaded the Turkish dignitaries in Athens to turn a blind eye while his craftsmen removed those parts of the Parthenon they particularly liked. Elgin never acquired the permission to remove the sculptural and architectural decoration of the monument by the authority of the Sultan himself, who alone could have issued such a permit. He simply made use of a friendly letter from the Kaimakam, a Turkish officer, who at the time was replacing the Grand Vizier in Constantinople. This letter, handed out unofficially as a favour, could only urge the Turkish authorities in Athens to allow Elgin’s men to make drawings, take casts and conduct excavations around the foundations of the Parthenon, where some part of an inscription or relief might be buried, with the inevitable proviso that no harm be caused to the monuments. Between 1801 and 1804 Elgin’s team was active on the Acropolis, hacking off and causing considerable damage to the sculptures and the monument, eventually detaching and dismembering a significant part (more or less half) of the remaining sculpted decoration of the Parthenon, together with certain architectural members such as a capital and a column drum. London and Athens now hold dismembered pieces of many of the sculptures. 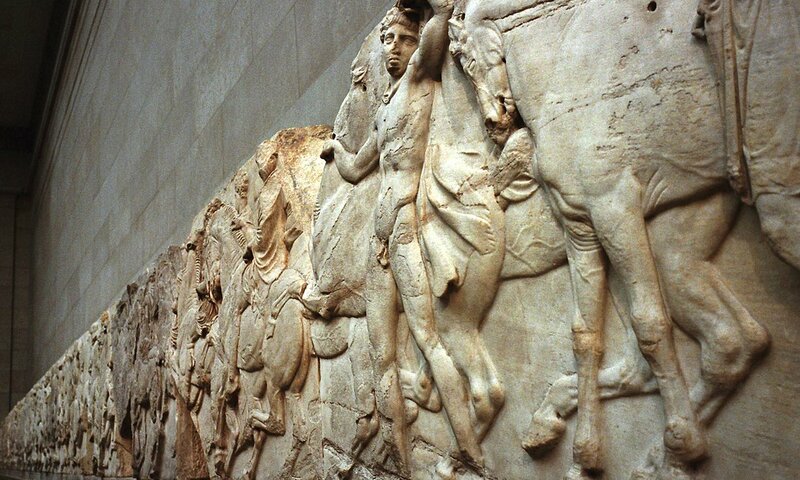 Of the 97 surviving blocks of the Parthenon frieze, 56 have been removed to Britain and 40 are in Athens. 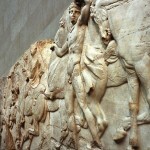 Of the 64 surviving metopes, 48 are in Athens and 15 have been taken to London. Of the 28 preserved figures of the pediments, 19 have been removed to London and 9 are in Athens. The shipping of these precious antiquities to Britain was fraught with difficulties, since they were moved from port to port. One ship sank and the sculptures, after prolonged exposure to the damp in various harbours, eventually arrived in England. In London they were shifted from sheds to warehouses, because Lord Elgin had been reduced to such penury by the enormous costs of wages, transportation, gifts and bribes to the Turks, that he was unable to accommodate them in his own house. So, after the mortgaging of the collection by the British state, he was obliged to sell the Parthenon Marbles to the British government, which transferred them to the British Museum in 1816. Prior to this transaction a select Committee was appointed to consider the purchase and the evidence it gathered was placed before Parliament. A debate took place, where many voices expressed their skepticism and disapproval. Even thoughts about the return of the Marbles were expressed for the very first time. Strenuous objections were heard outside Parliament as well, the most impassioned being that of Lord Byron.